The Spanish Football Federation said there would be no restrictions on players from outside the EU. New signing Malcom is in line to feature for Barcelona against Sevilla in the Spanish Super Cup. SEVILLA HAVE THREATENED to pull out of this evening’s Spanish Super Cup clash with Barcelona if the La Liga champions field more than three non-EU players. The Spanish Football Federation (RFEF) said on Saturday that there would be no restrictions on players from outside the EU for the Super Cup, despite only three being allowed in squads for league matches. Sevilla said they could withdraw from the game in Tangier, Morocco, if Barca name an “improper line-up”. “Sevilla FC is surprised by the RFEF’s announcement 24 hours before the Super Cup,” Sevilla said in a statement. “It has said that as many non-EU players as desired can be registered. In their last statement for the 2018-2019 season, only three were due to be allowed, without exception. 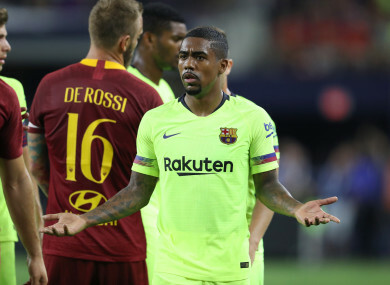 New signings Malcom, Arturo Vidal and Arthur will likely be Barca’s three non-EU players, although Brazilian centre-back Marlon has also travelled with the squad. Philippe Coutinho has reportedly acquired a Portuguese passport through his wife in the last week, while his fellow South Americans Lionel Messi and Luis Suarez are already EU citizens. Sevilla qualified for the match as last season’s Copa del Rey runners-up, after Barcelona won the league and cup double. Email “Spanish Super Cup in jeopardy as Sevilla threaten withdrawal from Barca clash”. Feedback on “Spanish Super Cup in jeopardy as Sevilla threaten withdrawal from Barca clash”.